If you’re in sourcing, recruiting or HR, you no doubt search LinkedIn from time to time or perhaps even every day. 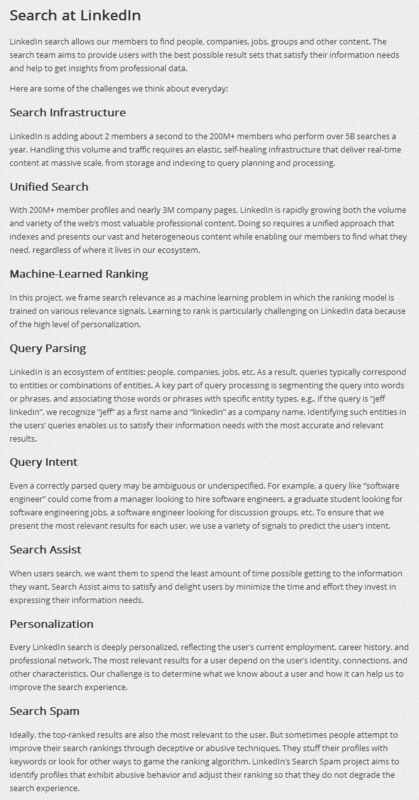 So why not gain a better understanding of how LinkedIn search actually works? And what better way to learn how LinkedIn search works than from the Heads of Search Relevance and Query Understanding at LinkedIn? Yes, you read that correctly – LinkedIn has folks specifically dedicated to understanding your queries in an effort to return the right set of results, emphasizing query rewriting, elaboration, and refinement. Here is the LinkedIn Search Slideshare deck where you can learn about, among other things, LinkedIn’s contextual word sense and how LinkedIn deals with “keyword stuffers” and spammers.